This is the perfect trip to experience stunning natural landscapes, arts and artisans, wineries and local cuisine on a fully guided bike tour. Kiwi Journeys arrange everything and limit the tour to ten people, so your experience is remembered forever. 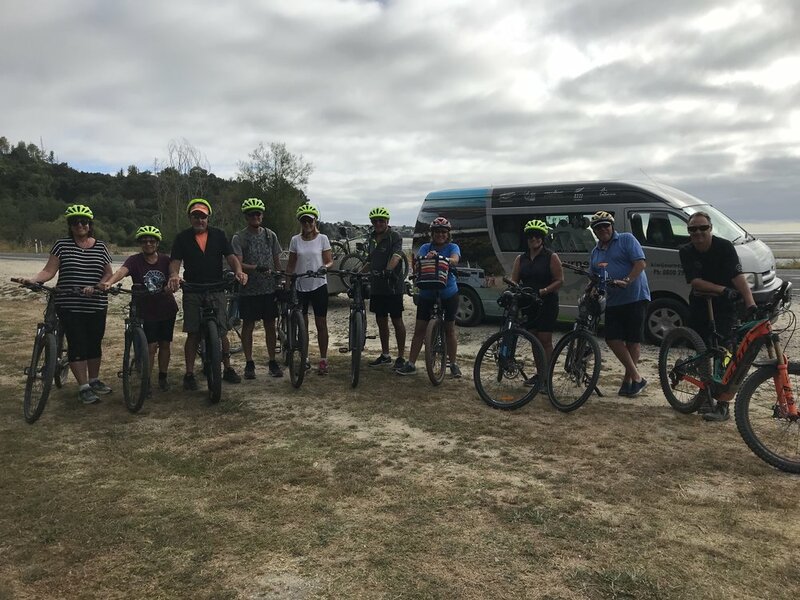 Get your group together and give us your preferred dates, or join a group on a set departure, and cycle in some of the most stunning scenery in New Zealand. 2019/2020 departure dates now available below. Kiwi Journeys will meet you from your flight or bus trip and and transfer you to your accommodation in Nelson, or you can make your own way there from 3pm. Relax, acclimatise to the beautiful Nelson region and prepare to experience an extraordinary bike tour. The first morning of cycling takes us along the old rail corridor. We will stop at the ‘World of Wearable Art’ (WOW) and Classic Car Museum before continuing down the old Railway Reserve cycle path on the way to Richmond. We may choose to enjoy a craft beer from Stoke or Eddyline Brewery before we turn onto the coastal path where there will be a chance to sample and purchase some award-winning wines at the Te-Mania / Richmond Plains winery. A fantastic lunch is not far away at the Grape Escape cafe. After lunch we experience the coastal boardwalks of the Waimea Estuary and fertile farmland, which is home to a range of internationally significant bird species including the White Heron. After crossing the spectacular Waimea Swing Bridge, we will take a left hand turn, where a five minute ride will have us arriving at Seifrieds for tasting # 2. Seifrieds is the oldest and largest winery in Nelson. From this point it is ten kilometres to the Mapua Ferry landing. The trail takes us alongside the main beach of Rabbit Island (great photo opportunity) where you will shortly arrive at the Ferry landing. A short trip across the channel on the iconic Mapua Ferry lands us at the Mapua Wharf where you can enjoy the buzzing atmosphere of galleries, studios, restaurants, cafes, shops and the boutique Golden Bear Brewery. Dinner tonight is included at the premium restaurant, Jellyfish. Today’s ride is grade one (easy). You will have plenty of time to relax and take everything in, especially the amazing food, beverages and activities on offer. After breakfast it’s on our bikes again for a short ride through Ruby Bay towards Tasman and on to New Zealand’s number 1 café ‘Jester House’. Here we can enjoy, a coffee, the lovely gardens & feed the tame eels! On leaving Tasman, a steady climb up to Tasman View Road awaits us. This is all worthwhile once we reach the lookout, as we take time to enjoy the spectacular 360 degree views of Tasman Bay and the ranges beyond (this section is grade 2-3 and has a climb of 200 meters over 4 km’s). We will then descend down into the Riverside Community and on to Motueka. A Healthy Lunch menu awaits us at ‘Toad Hall’ at the beginning of Motueka. After lunch we will make your way around the amazing coastal trail of Motueka, you can enjoy the variety of bird species and gorgeous scenery. From the outskirts of Motueka, Kaiteriteri is approximately 12km’s away. The short bike ride into Kaiteriteri takes in boardwalks and bridges through the farmland and orchards of Riwaka (NB: two great cafes in Riwaka together with the Hop Federation Brewery!) before entering the ‘Easy Rider’ trail of the Kaiteriteri Mountain Bike Park. This 4km section through the mountain bike park winds through the stunning native beech forest. A reasonable level of fitness is required to bike this section and caution must be taken by inexperienced riders as there are tight turns and switchbacks. Once we enter Kaiteriteri you can explore the beautiful golden sands which mark the gateway to the famous Abel Tasman National Park. Tip: This part of the trail is the only section that has some hill climbs. Kiwi Journeys have the latest E-Bikes available should you have any concerns about the hills. Farewell Kaiteriteri, and after exiting the mountain bike park, we will re-trace our steps back to Riwaka. A coffee stop at Mrs Smith’s Café is always a must. Winding our way out of Riwaka, we turn left onto Factory Road, where the trail heads down the West Bank of Motueka River. Enjoy the quiet country roads passing through farmland whilst following the Motueka River. When we arrive at Peninsular Road, we turn left off the Trail, and head to the Peninsular Road Bridge. This is a fantastic spot for a well-deserved swim in the pristine Motueka River. Once we have cooled off, a five minute shuttle has us arriving for a special Winery lunch (and tasting) at Dunbar Estates Winery. After lunch it’s back in the shuttle for a short trip to Kohatu, before we are back on our bikes again, riding the new section of trail to the entrance of the Spooners Tunnel. At 1,352 metres long, this tunnel is the oldest disused rail tunnel in the Southern Hemisphere. The tunnel is pitch black and is a constant 10deg so take your jumper. After exiting the tunnel, a lovely downhill gradient takes us down to the Belgrove Tavern where we can relax for a drink amongst the beautiful garden setting, before cycling the final section (and the newest part) of the trail to the quaint village of Wakefield, where you will stay the night. Today’s riding is grade one and very relaxing. Your final day of riding is a leisurely day making our way back to Nelson. We cycle beside quiet country roads towards Brightwater where you can have your first coffee stop for the day at HQ Café. On leaving Brightwater, we cycle over the Waimea River via a swing bridge with stunning views of the New Zealand Alps. Continue cycling through the gorgeous vineyards, orchards and farmland into Richmond. Making our way back to the Kiwi Journeys Nelson Depot with the option of visiting the Olde ‘Honest Lawyer Pub’ for lunch. From the Honest Lawyer, Choose to be transferred to the Airport or your accommodation, or ride into Nelson to complete your Great Taste Trail adventure. Extroardinary Great Taste Tour………e-Bike Style! · NZ$2,199.00 per person (based on 10 guests) Please contact us for pricing on smaller groups.